I was wondering if playing with the presets editor, Podium would be capable or not to get the best performance of the Kray engine. I don't know, can we find all the settings needed? For most people, the level of realism we see on this picture is probably not necessary but it is really impressive. WAOW! Janusz from the Kray forum has posted here before. He knows what Podium does, and he has helped me with the presets. 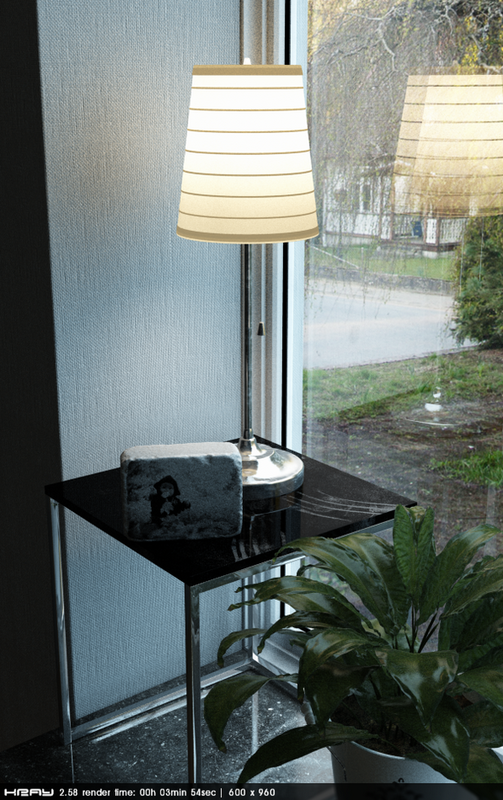 The biggest and insurmountable difference is complexity of materials in Lightwave. That has nodes and procedural materials as well as pure textures. It means that you can get a lot more subtlety in your material settings. Yes with the Preset editor you can get a lot more control than with our presets. In that regard, yes, you have access to more complexity. Materials are the big problem though, and I don't see us being able to introduce a node-based materials editor. Apart from the actual UI complexity (which comes from Lightwave) which we would have to duplicate, the whole principle of creating materials is simply much more involved and difficult. There are more Kray features we can use ( like instancing for example) that haven't been implemented and the new Kray 3 looks very impressive, and is even faster. Thank you for the answer Jim! Podium is very effective thanks to his ease of use and the quality we can get from it, so, yes, it should stay easy. Janusz looks like the master of master of Kray! it could be really interesting to see a render from him made with the Podium's preset editor. Is there any we can find? I've spoken to Janusz at length about Podium, Kray and their differences. However, the high presets were modified by me following a long discussion with him on Skype, so in terms of quality, those presets are kind of his. The 1.0.5 series of presets Jure helped me with. There are things that LW does differently, and Janusz's way of working is more complex than most Podium users would be inclined to do. For example he puts invisible LEMs outside the windows and below the ceilings, and always sets the photon multiplier to 1 (this is a parameter that boosts the strength of the photons, for interiors, to keep things simple, I set this to 2) and he has lower settings for the input tonemapper. This means that his lighting is rather different to ours, and he always uses After Effects (not Photoshop) for post-processing. He thinks it'a much better tool. The point is that he has developed what to novices is a complex workflow, but because it's second nature to him, it's fast and efficient and delivers fabulous results. Similarly with Jure's recommendations, we had to modify some things for SketchUp and Podium's way of working. Janusz spends a lot of time on his materials, and we simply don't have that degree of sophistication in SU or Podium. If I'm really honest, I don't know how much difference that complexity makes. Janusz's images are amazing, but I don't know how much is down to After Effects, materials or lighting. It may be that you just get a small improvement in each element, but altogether they add up to a much bigger one. That's great to know a bit about all this stuff and his workflow. what he can do after applying all his method with a render made in podium. Understanding that SU Podium must be simple, are you planning to give materials a little more of customization options? It would be very nice to have diffuse, reflectance, transparent, absorption layers or dimensions. We will probably add more customisation options for materials, but this will most likely be limited to reflection blur and normal/bump maps. Nothing like you are suggesting because they would add too much complexity. I wouldn't use things like absorption layers for example. Well anything new in that matter is good for us. That normal/bump sounds great. Matu, you already can define absorption - simply make the DTR sum less than 100. It is very useful for materials such as plastics and rubber. Will Podium ever be able to use GPU instead of CPU to render scenes? The longer answer is that this only relevant to speed, and the question really ought to be, "Is Podium going to get any refinements to improve speed?" In that respect, the answer is "Yes"
GPU rendering will only come when we change the render engine, as Kray 2.x does not support it. However, there are are numerous things that are being considered to improve render speed further. Thanks Davor, i will look into that and play with it. I've switched back to Podium from Thea, as the podium browser really is a massive productivity booster. Hi, guys, any news about Kray 3 and Podium 3? Kray 3 is still in beta. Until it comes out of beta, we are most likely not going to look at incorporating it. We have a number of features to implement long before this though.